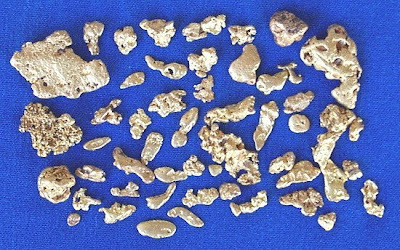 The advent of well-designed and engineered gold-seeking metal detectors in recent years has enabled nugget hunters, prospectors, and miners to increase their success rate exponentially in recovering placer nuggets and detecting vein gold material. However, I am not an expert by any means when it comes to electronic prospecting, so I'll leave that discussion to those who are (and there are evidently plenty out there these days....a simple online search will bring up dozens). But you can see by the title of this post that's not my topic, at least not finding nuggets electronically. So what do I mean when I say finding "nuggets the old-fashioned way?" Am I talking about simply getting lucky and occasionally finding a nugget or two in my gold pan or sluice box, or reading a stream so well I can predetermine where those nuggets are hidden, or my sniping abilities are so well-honed my success rate is nearly phenomenal? Actually, all three of these and a bit more, if the truth be told. 2 Oldtimers Who Knew Their "Stuff"
But I am not speaking about myself in this regard (I'm good, but not that good! ), but two oldtimers, both of whom I knew for many years and both who knew their "stuff." Unfortunately for all of us and placer mining in general, both of these outstanding individuals are now working claims on the other side of Heaven's Gate (may their pans be full of yellow metal). Yet both of these men taught me a great deal about the "ins and outs" of placer gold mining and both literally astounded me with their ability to find gold nuggets the "old fashioned way." That is, without fancy machines or gear costing thousands of dollars. Nope. As a point of fact, they were immensely successful over time using the most basic tools and equipment out there (should you be wondering). How were these two oldtimers able to do what they did? In a general sense the answer is simple: they both employed tried and true gold-mining principles in a systematic way, they both were willing to work hard to get their gold, and they continually pushed the parameters of their own mining knowledge and experience. Coincidentally, both men developed their own individual "plans of attack," techniques, and methods for recovering nuggets and coarse gold using tools and gear designed or adapted for their particular approach. And both miners recovered hundreds (yes hundreds and more) of placer nuggets in every size, shape, and weight. Ponder what I have alluded to here.... Has your curiosity been piqued? Good. Because in Part 2 of this series of posts I'll get down to the nitty gritty in terms of just how these two oldtimers "pulled it off." Until then be safe and keep smiling! If you liked this post, you may want to read: "Gold in the Southwest: Texas"